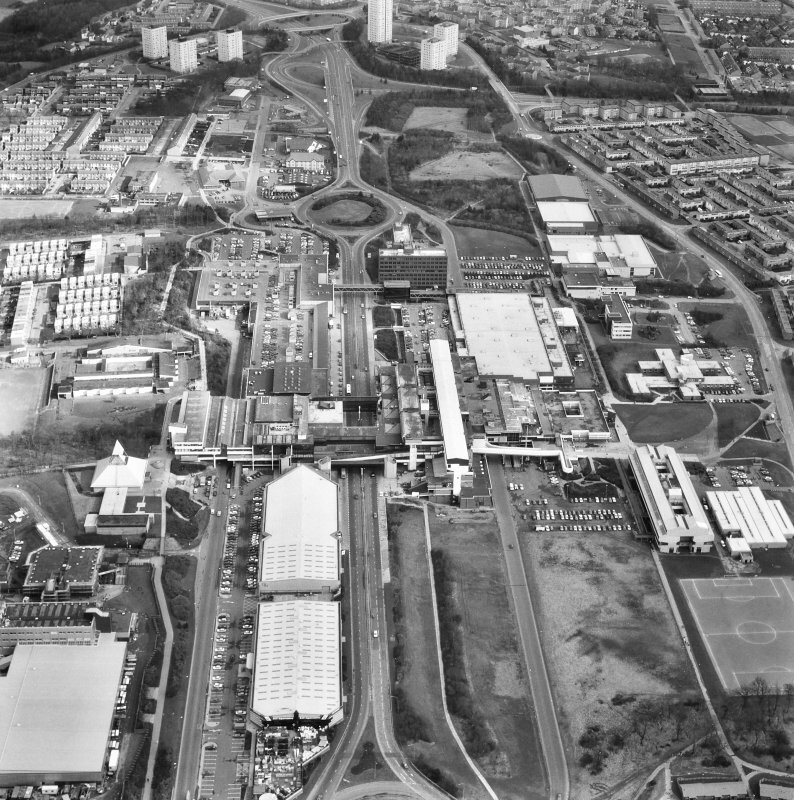 Oblique aerial view of Cumbernauld centred on St Mungo's Church in the town centre, taken from the SW and recorded as part of the World of Worship project. 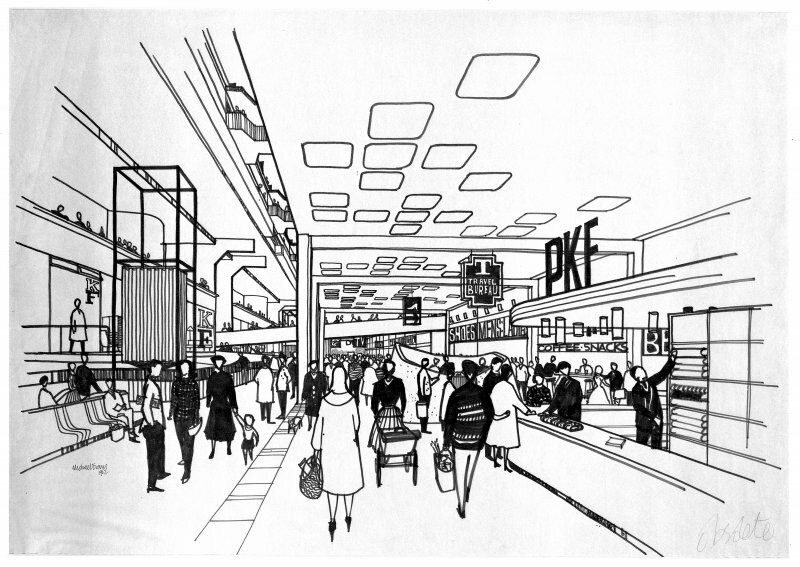 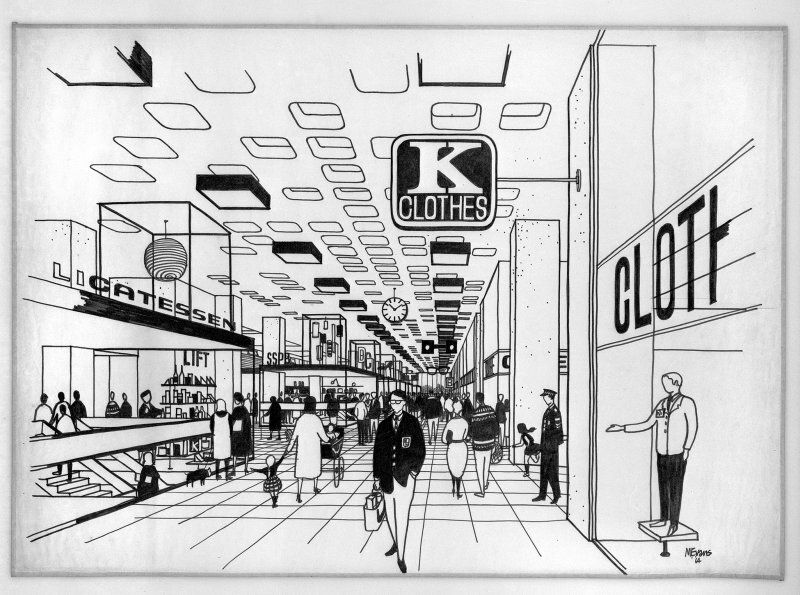 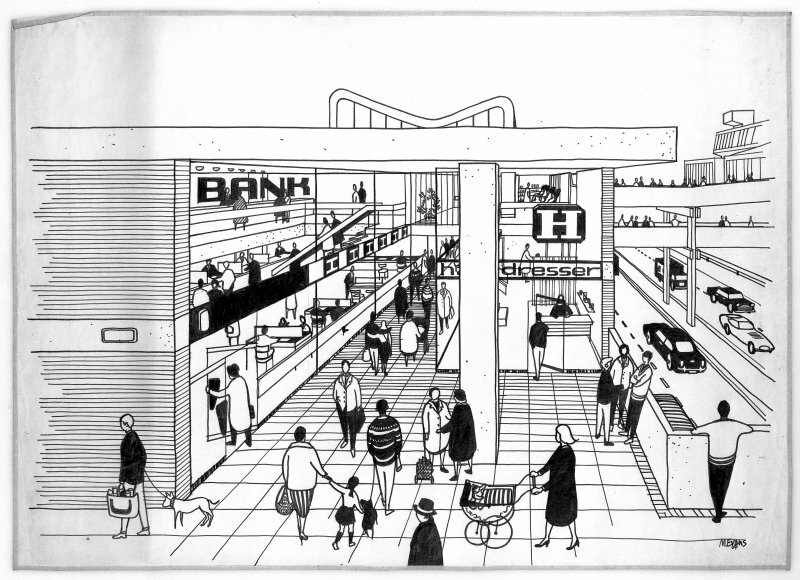 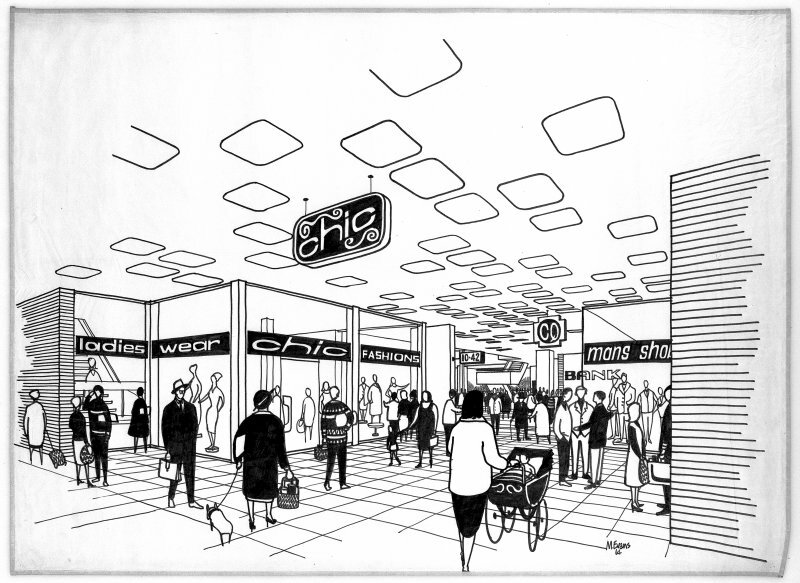 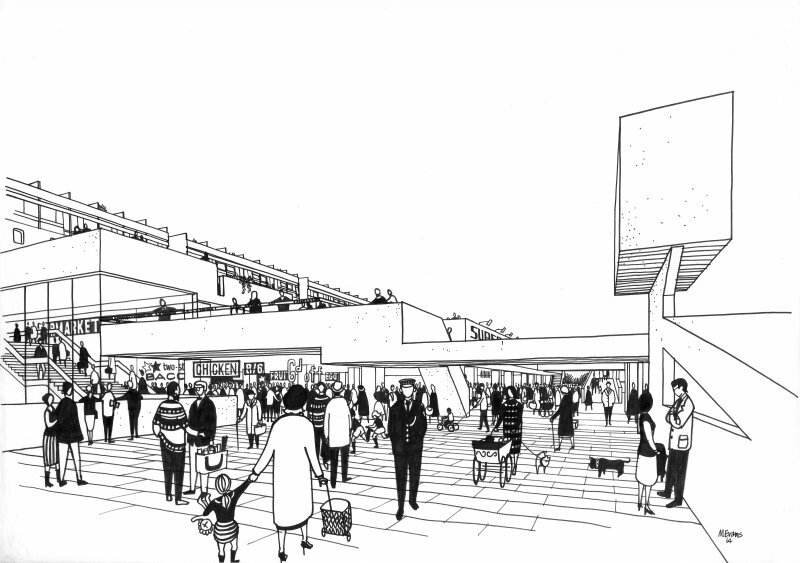 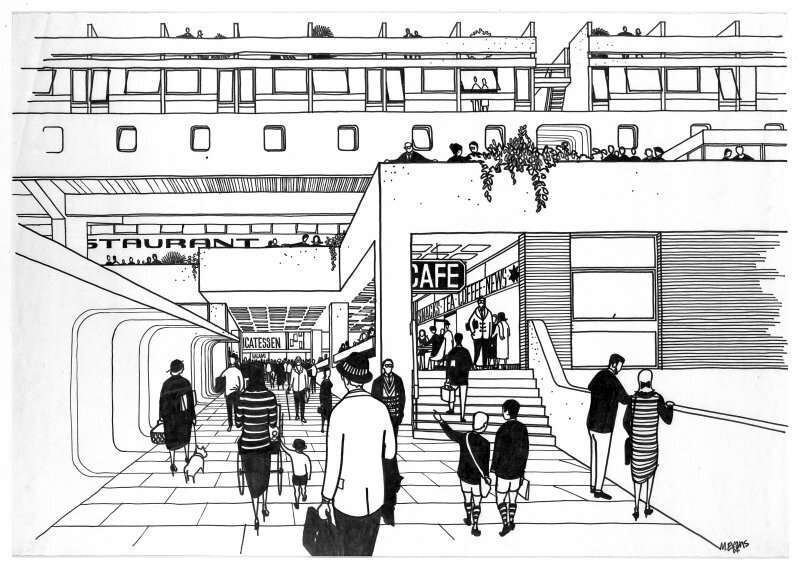 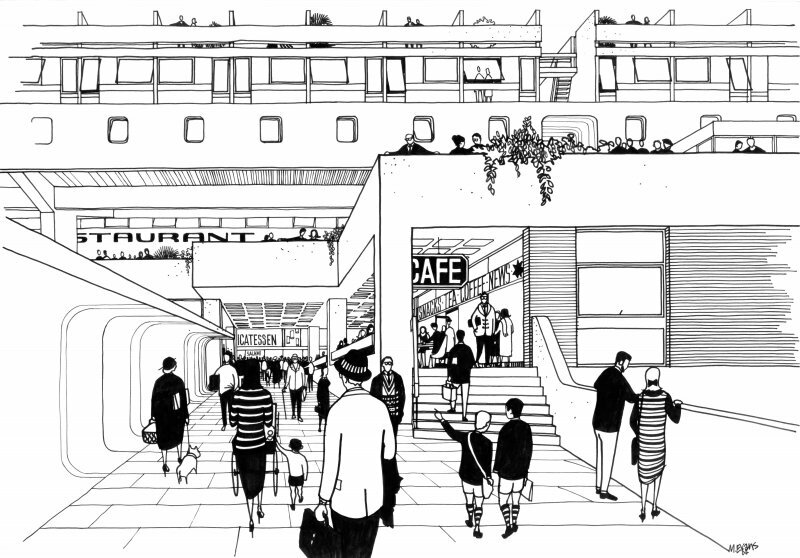 Drawing of Cumbernauld Town Centre, by Michael Evans. 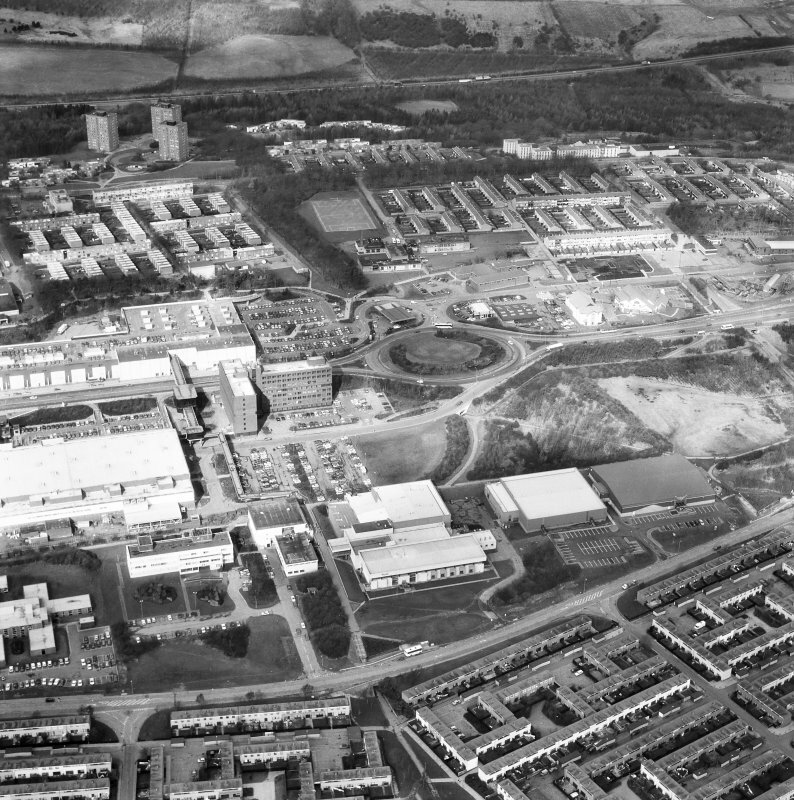 View from South of South car park, Cumbernauld. 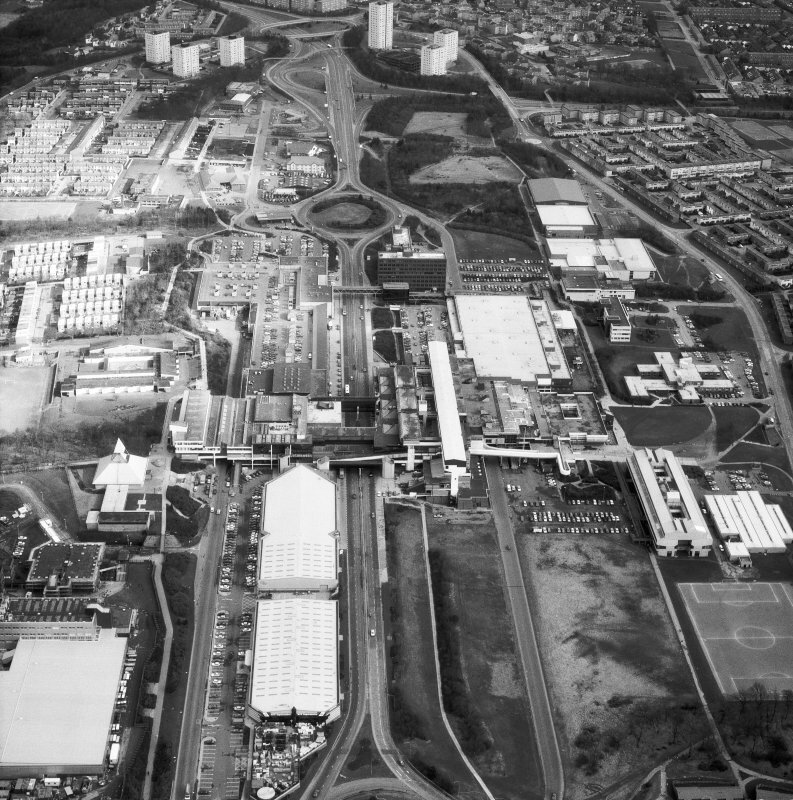 Oblique aerial view of Cumbernauld centred on St Mungo's Church in the town centre, taken from the W and recorded as part of the World of Worship project. 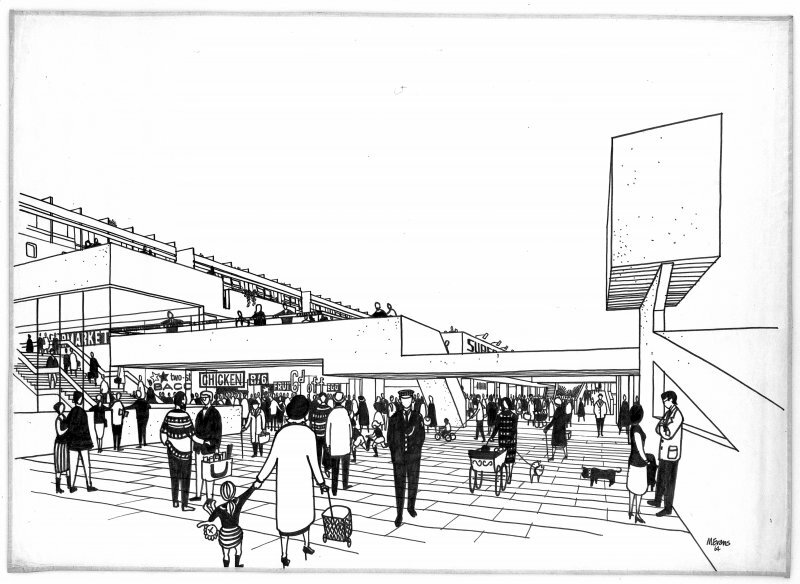 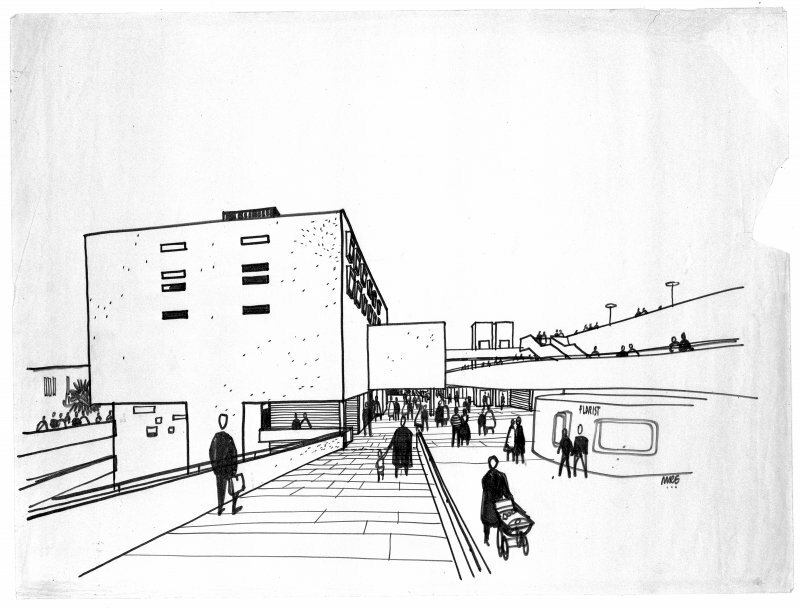 Drawing of Cumbernauld Town Centre by Michael Evans. 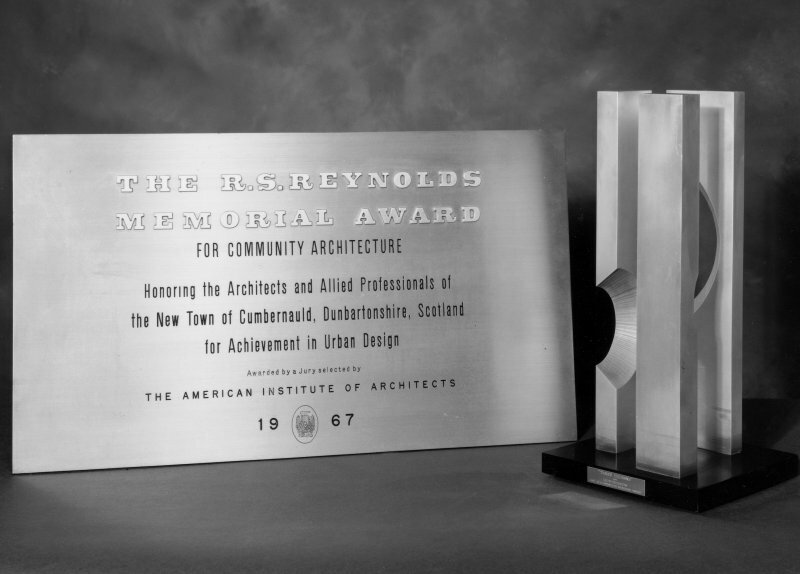 View of the R S Reynolds Memorial award plaque and sculpture 'Three Columns' by Roy Gussow. 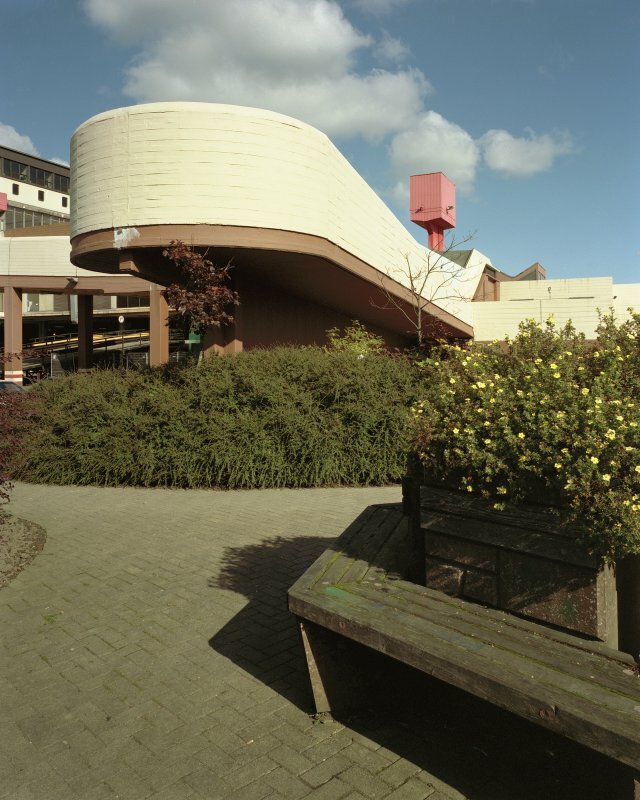 Awarded to Cumbernauld New Town in 1967 for Community Architecture by a jury selected by The American Institute of Architects. 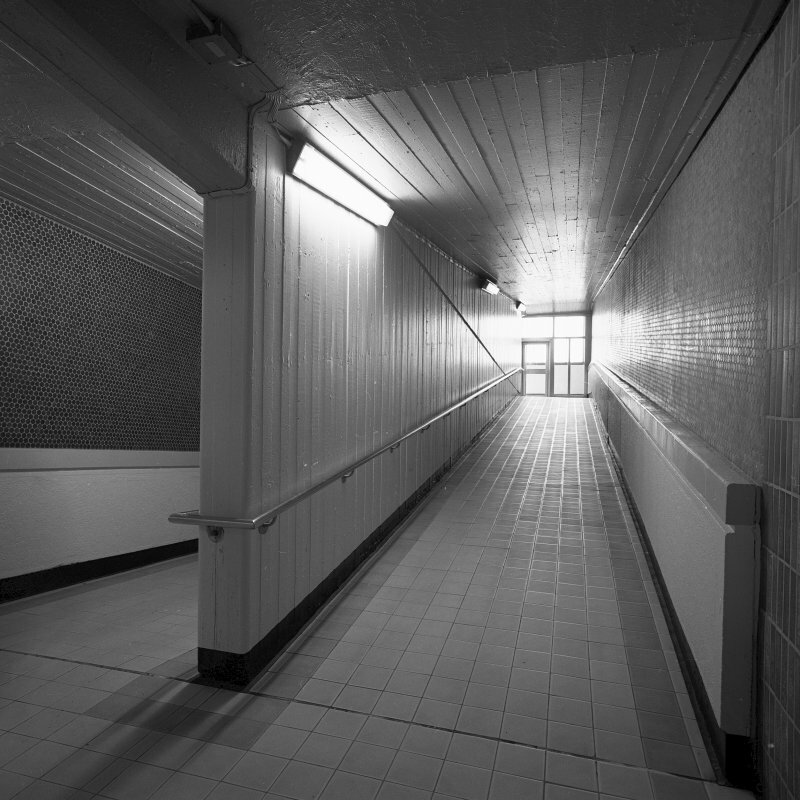 Digital image of D 7264. 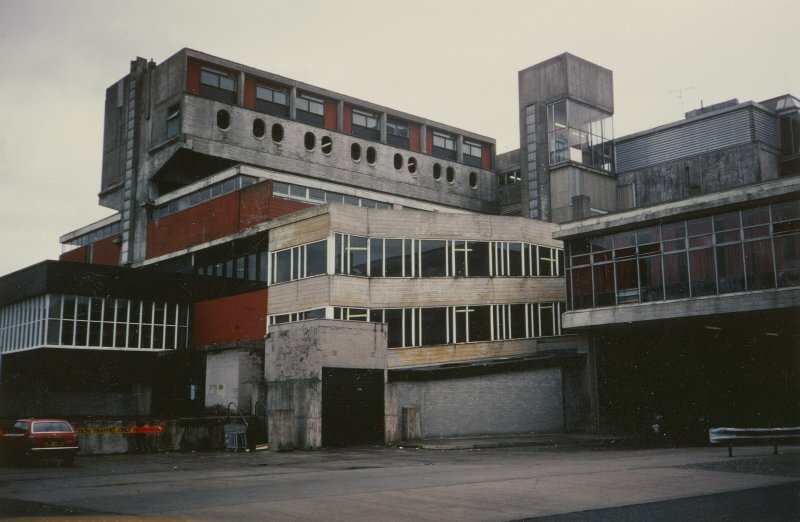 View of Town Centre prior to repainting. 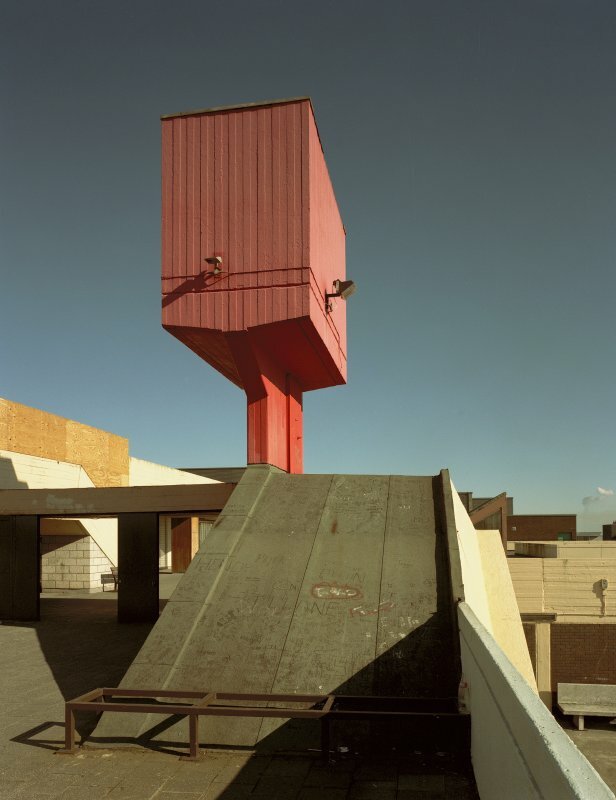 Digital image of A 7114 PO. 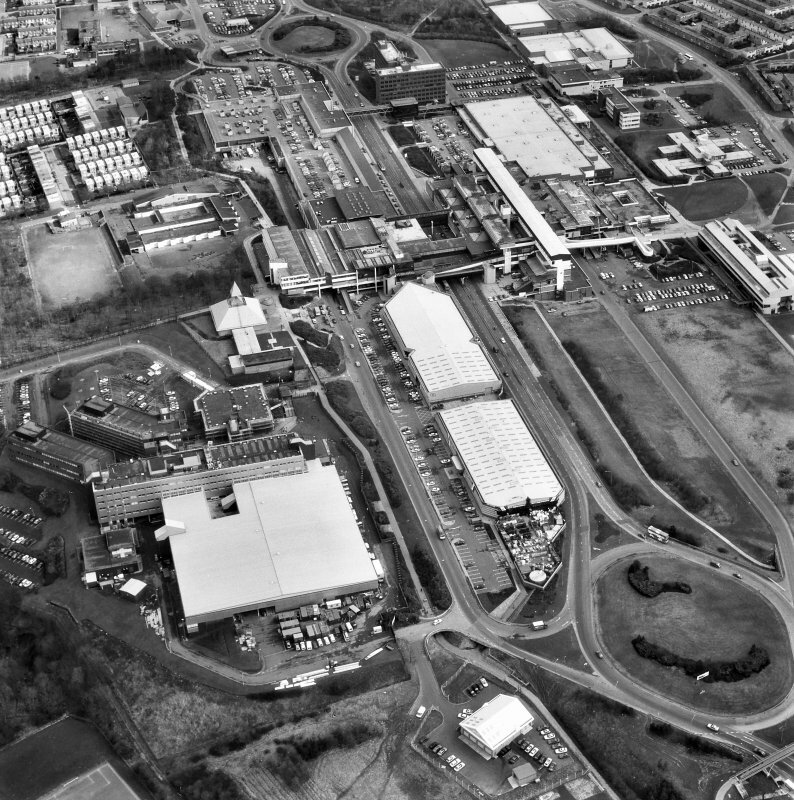 View from South-East of Phase I, including South approach ramp. 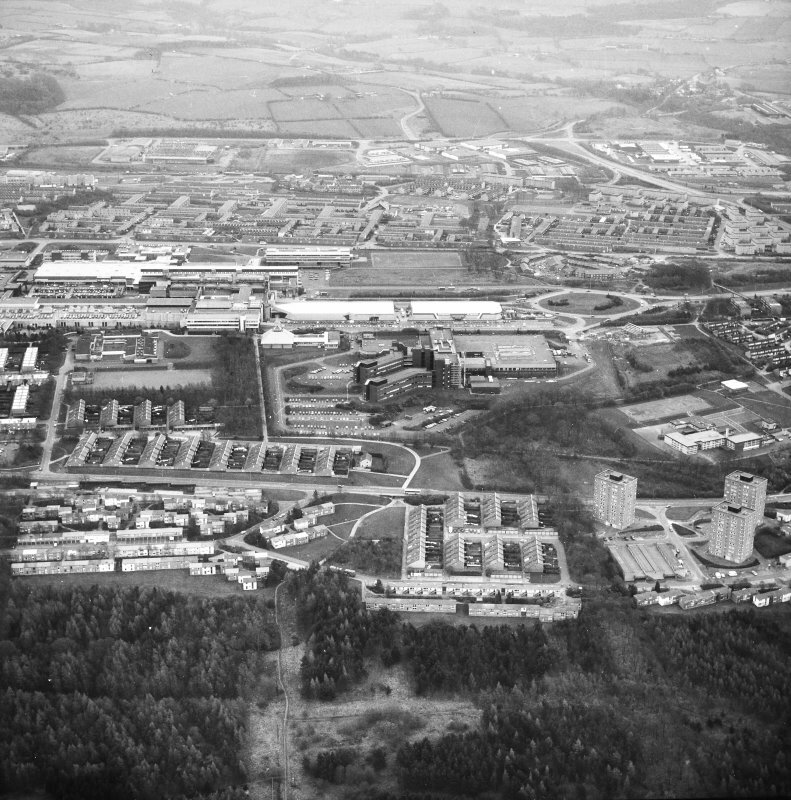 View from South of Phase I, Cumbernauld. 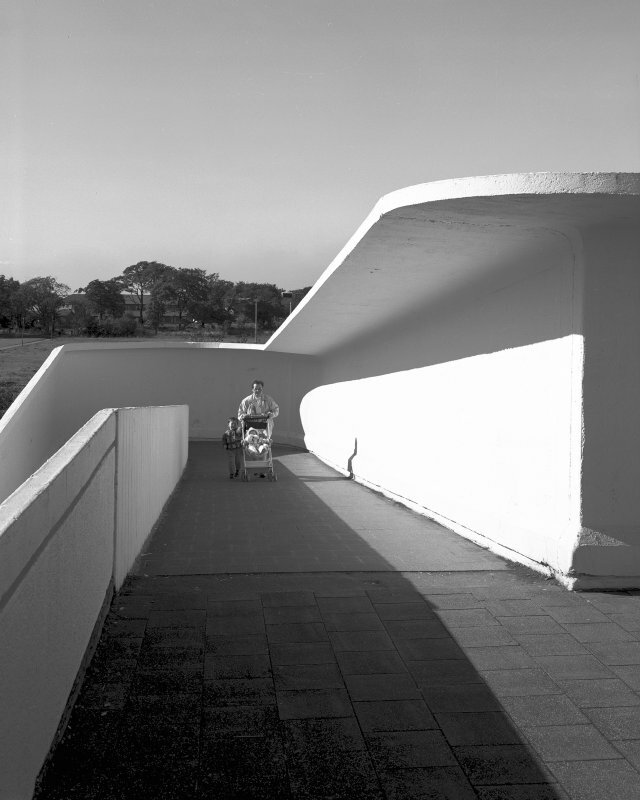 View from North-East of curved staircase to South approach ramp. 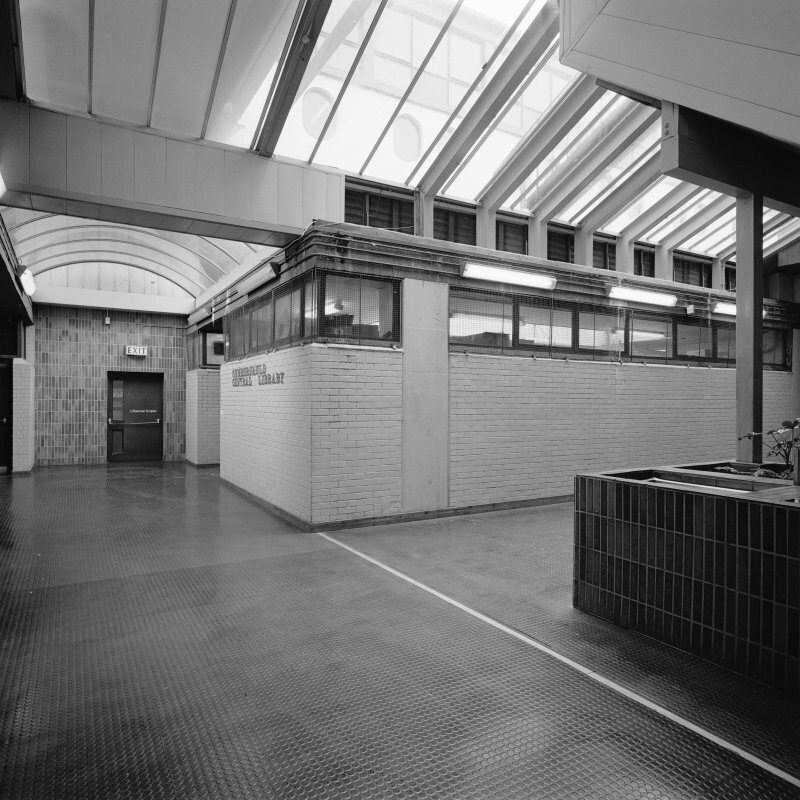 Digital copy of photograph of view of Ettrick Square, escalator hall. 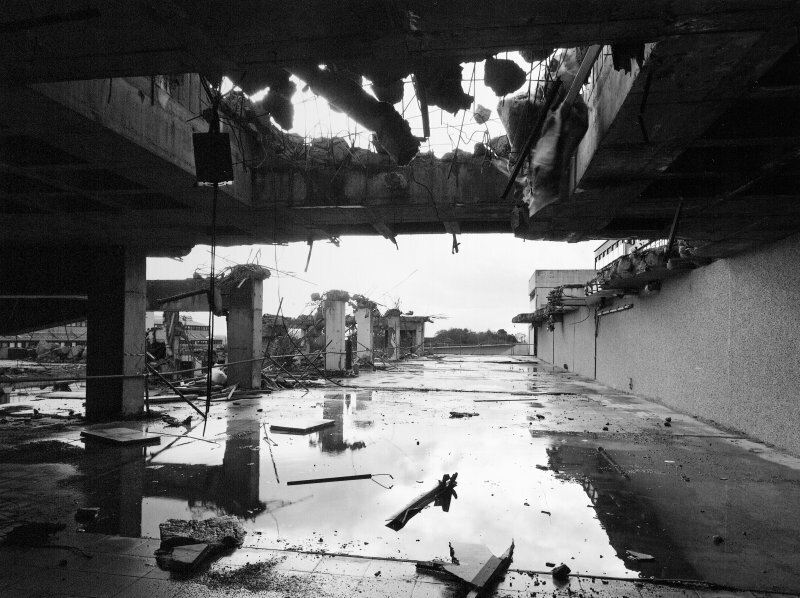 Phase I. 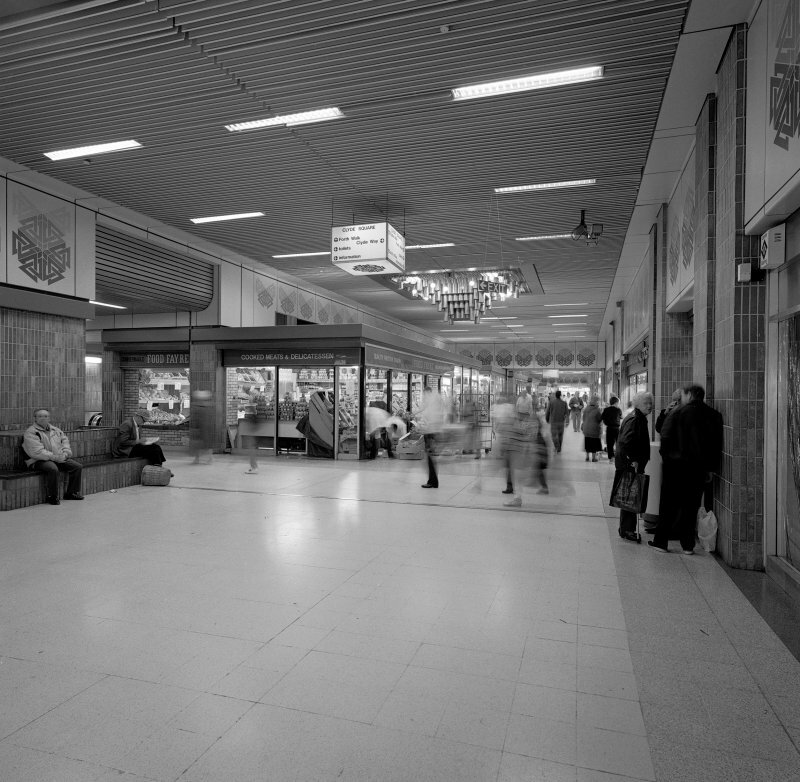 View of Clyde Square on main concourse. 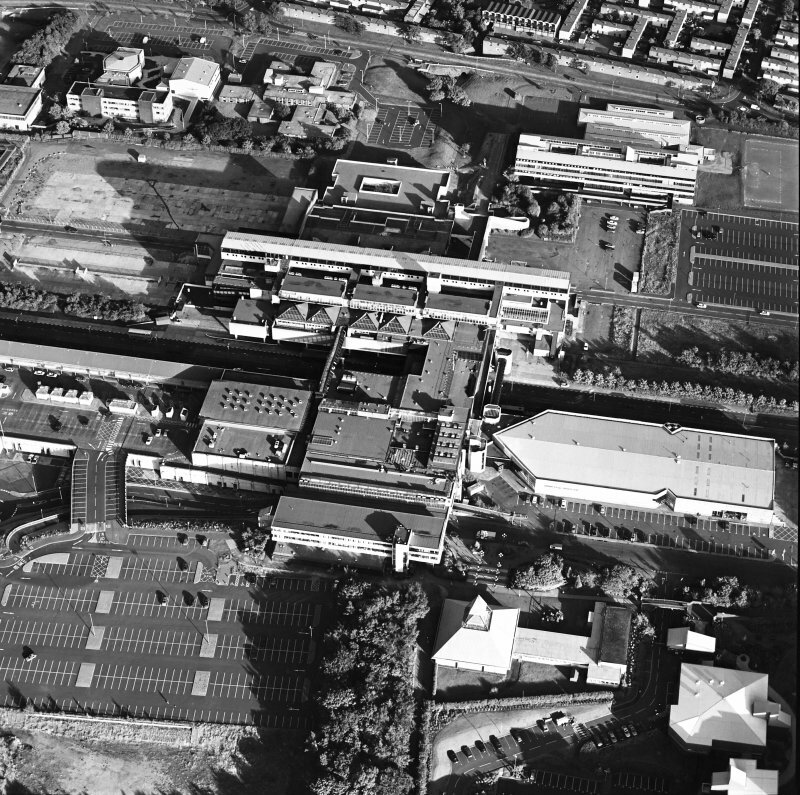 Digital image of B 45109. 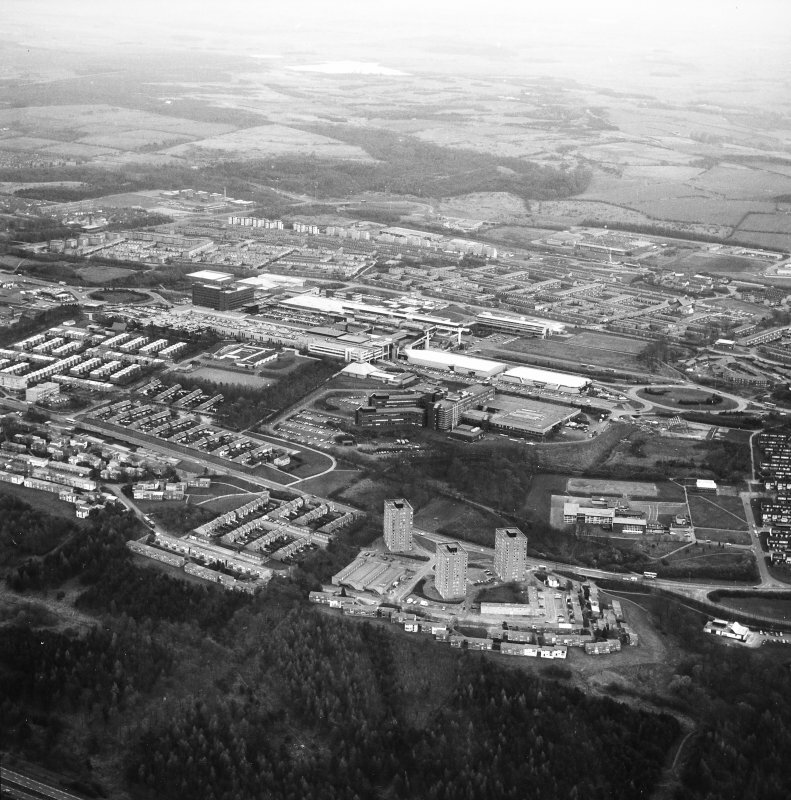 View of water tower on South Terrace, Cumbernauld. 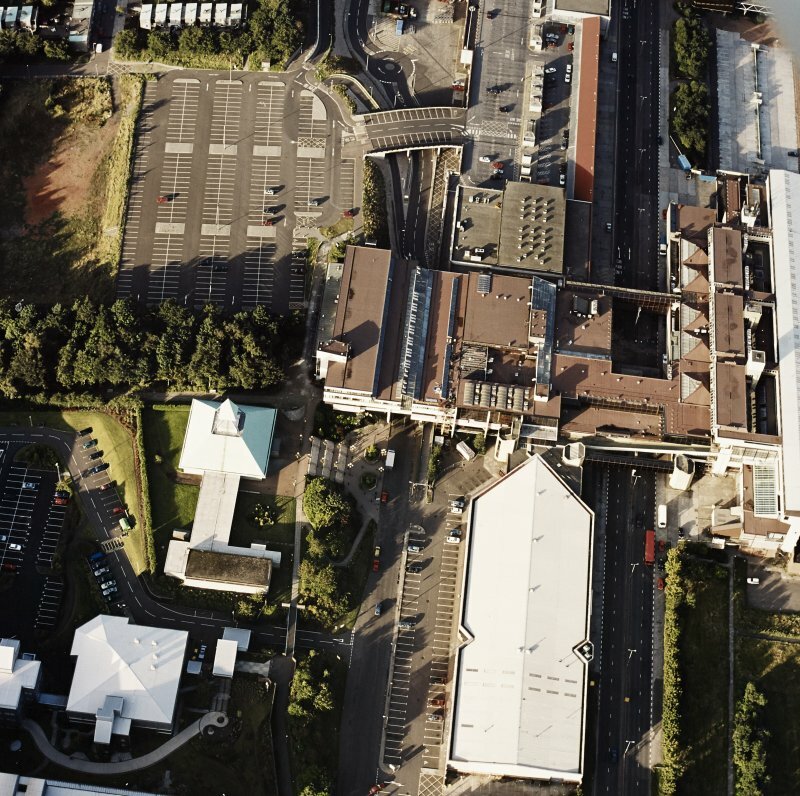 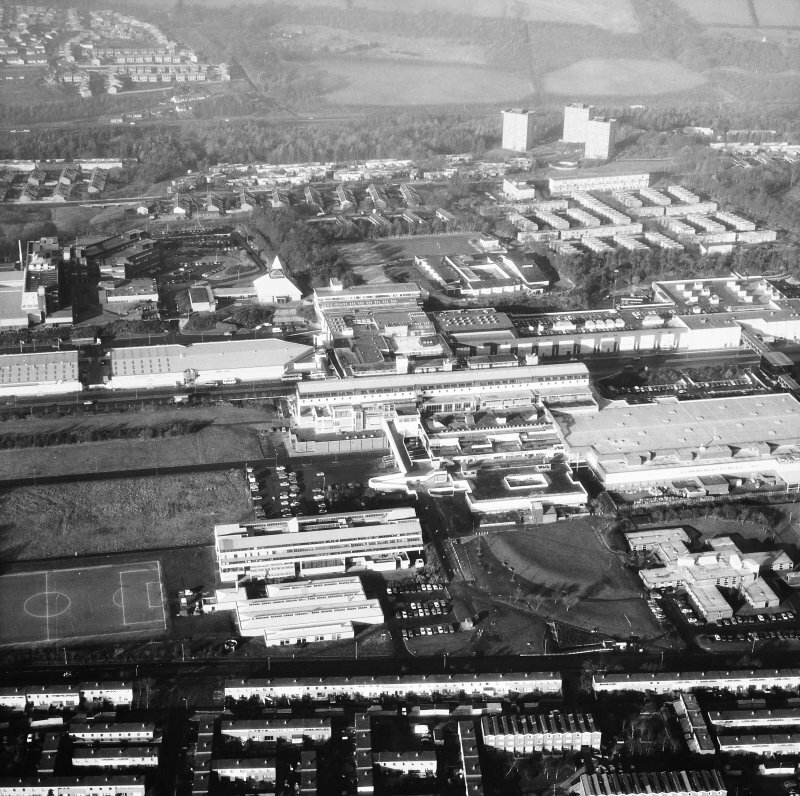 Oblique aerial view of Cumbernauld centred on St Mungo's Church in the town centre, taken from the SSE and recorded as part of the World of Worship project. 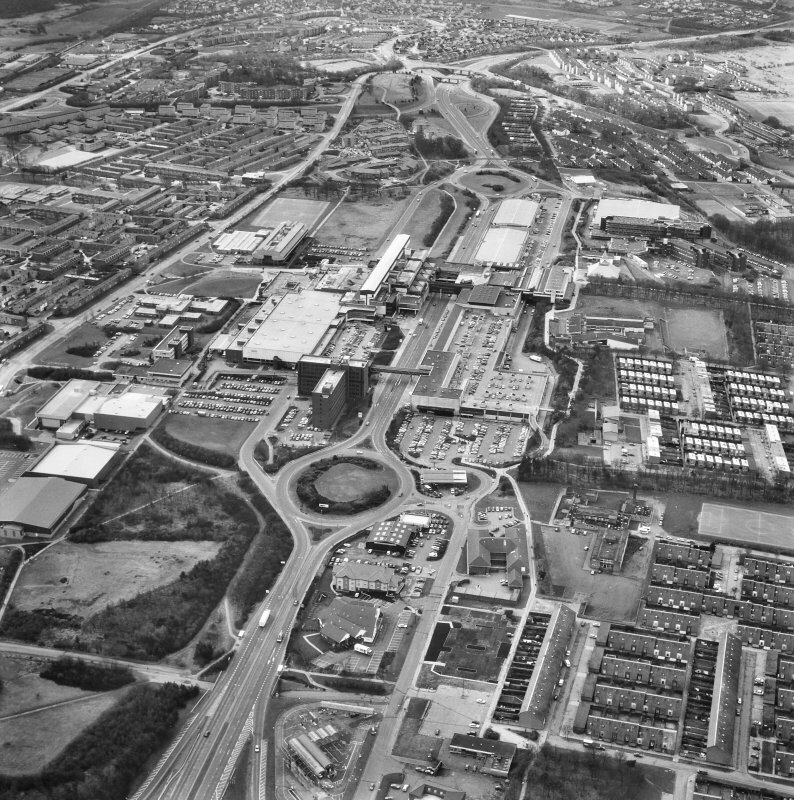 Oblique aerial view of Cumbernauld centred on St Mungo's Church in the town centre, taken from the WNW and recorded as part of the World of Worship project. 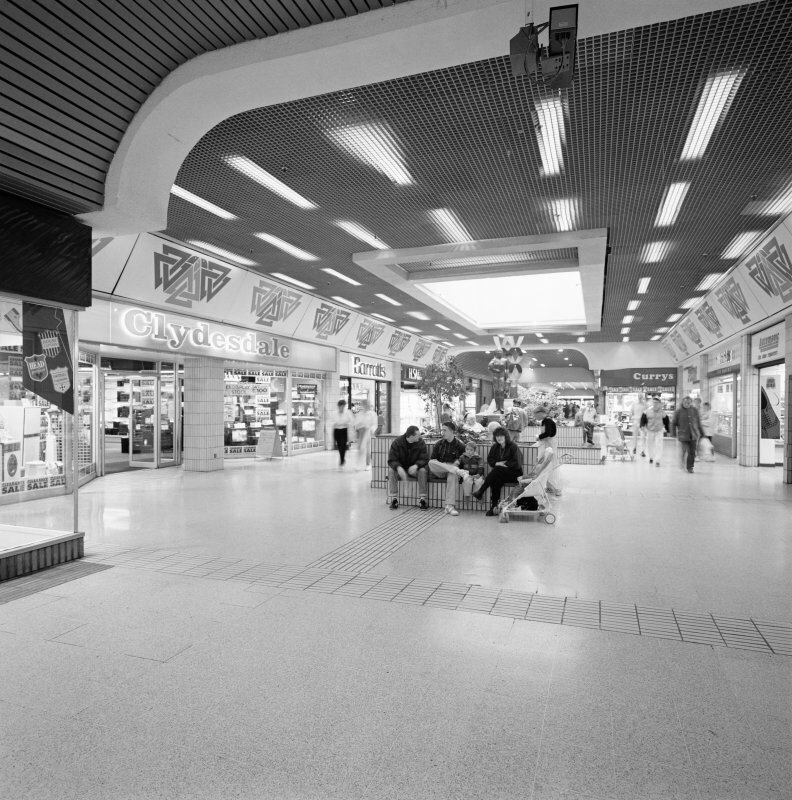 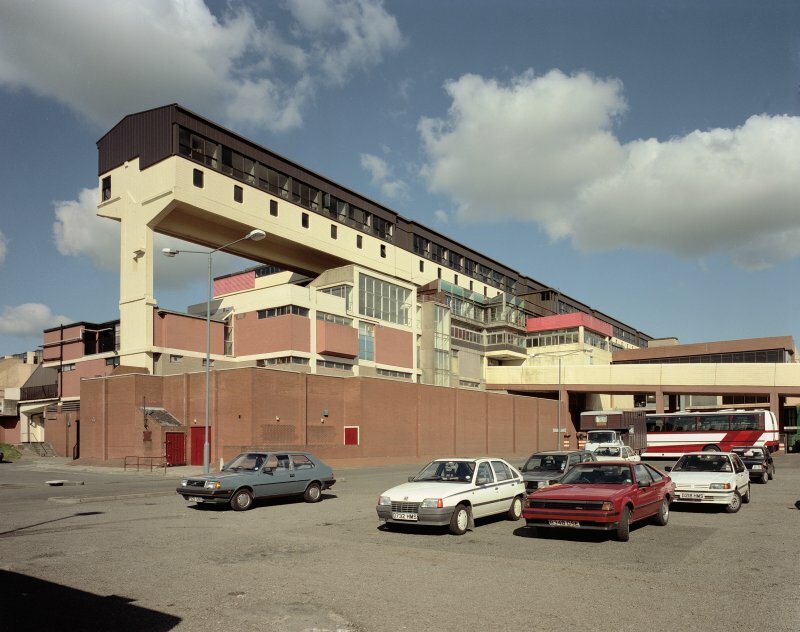 Digital copy of photograph of view of Teviot Walk mall. 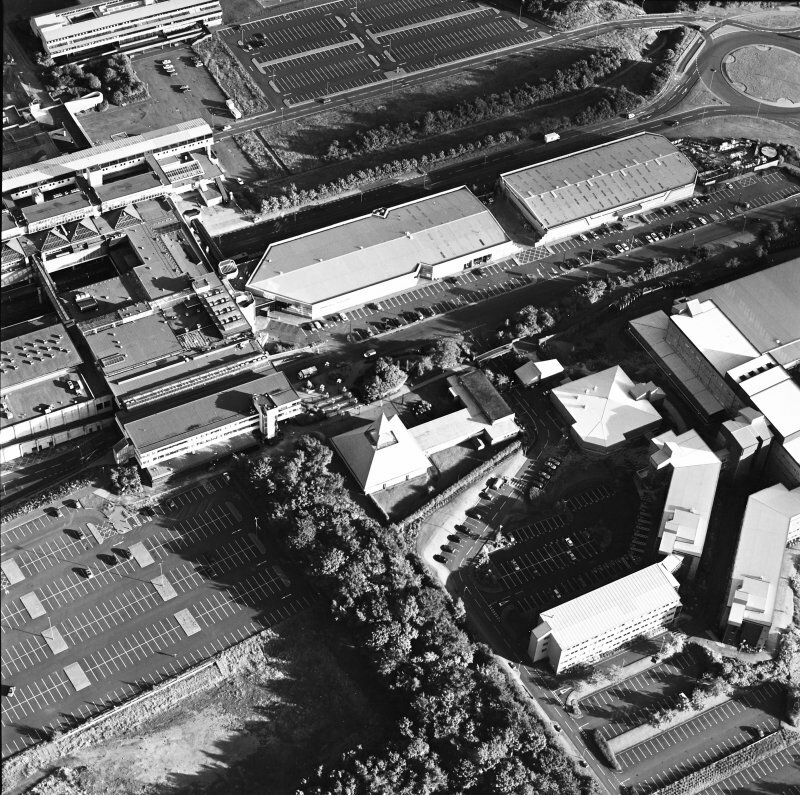 Phase I. 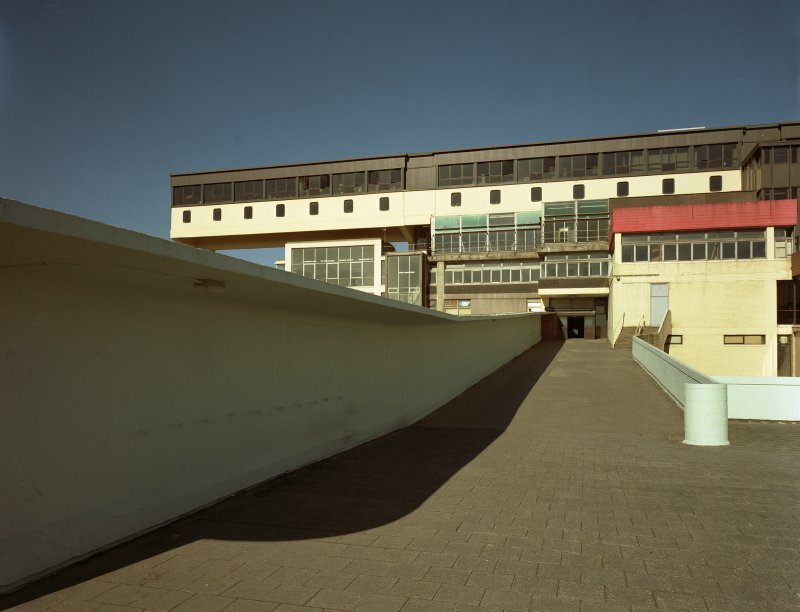 View of South-West access ramp. 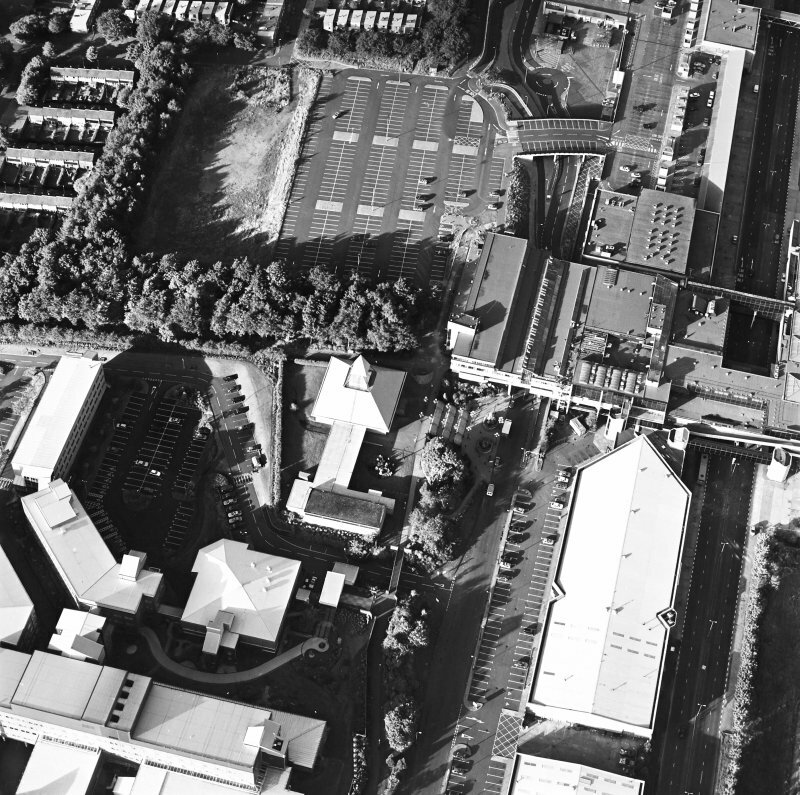 Digital image of B 45111. 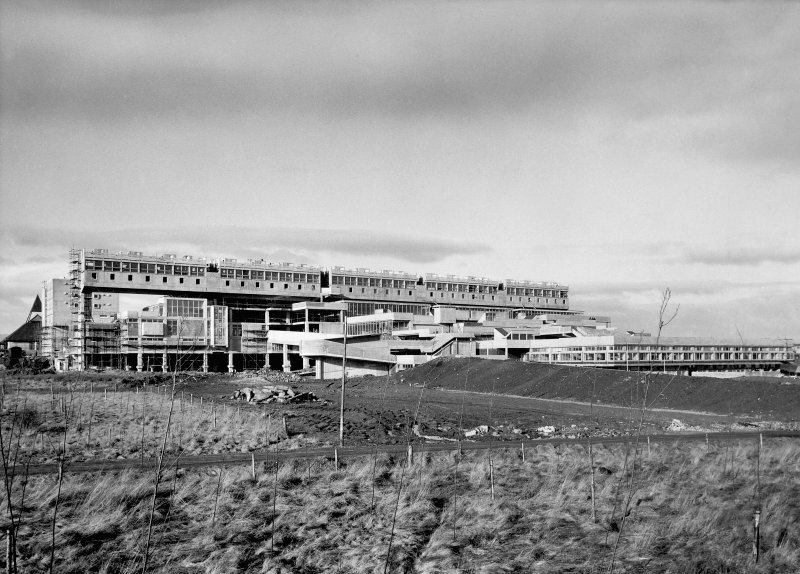 View of relief decoration on South-East wall of South car park, Cumbernauld. 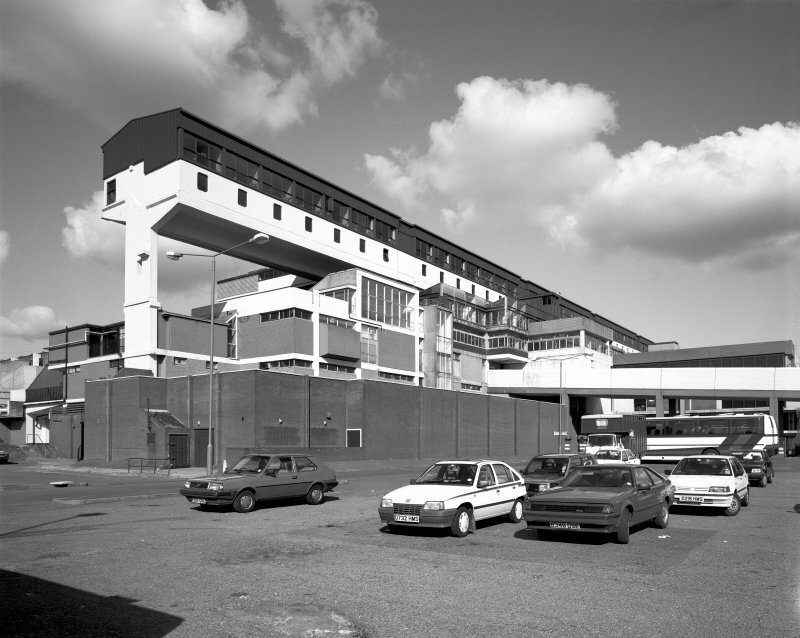 General view of water tower and access stair to South terrace. 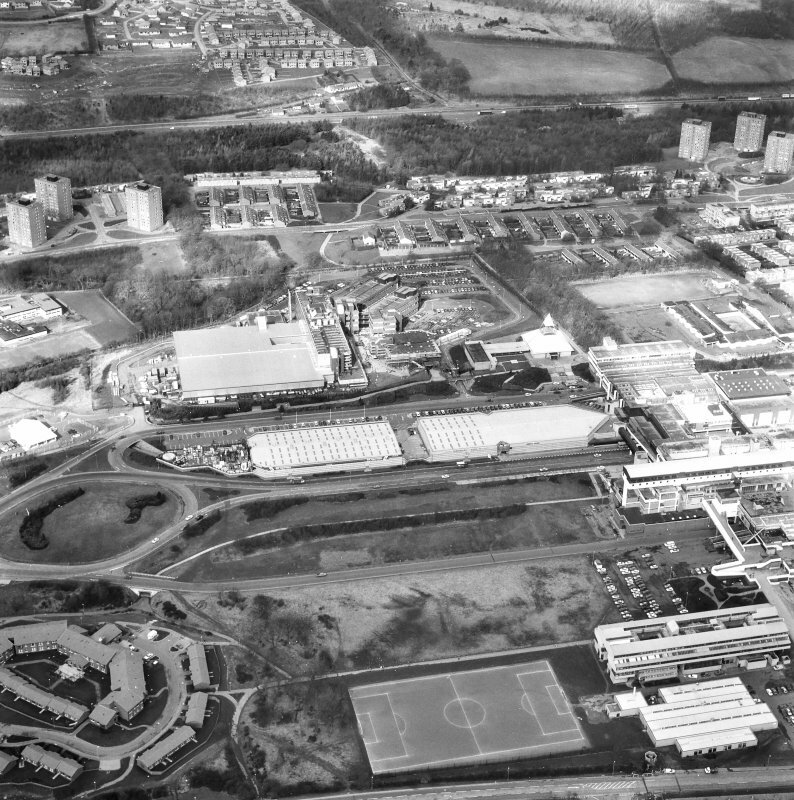 Oblique aerial view of Cumbernauld centred on St Mungo's Church in the town centre, taken from the NW and recorded as part of the World of Worship project. 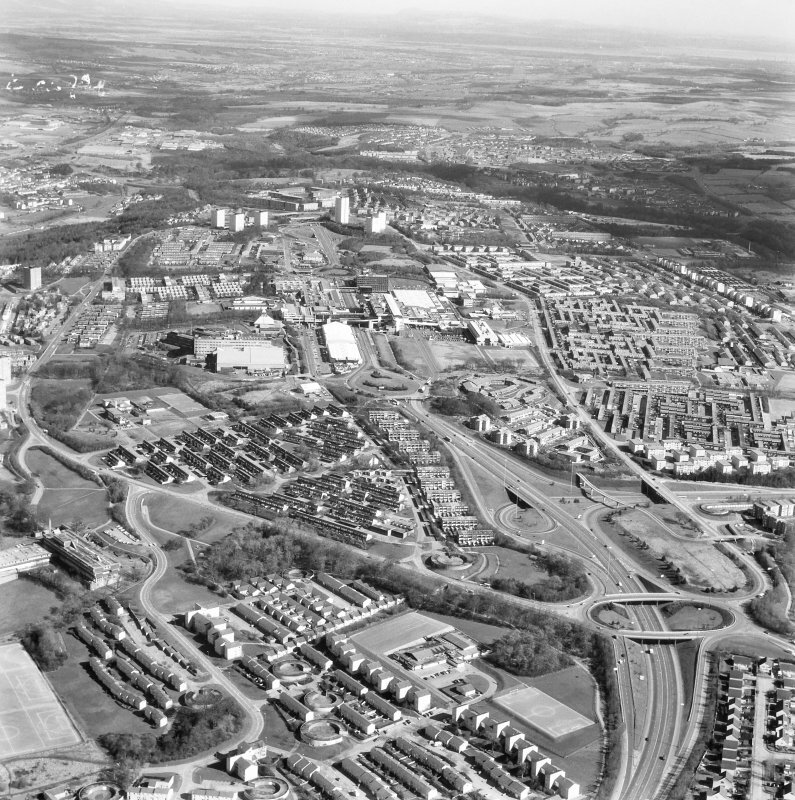 Oblique aerial view of Cumbernauld centred on St Mungo's Church in the town centre, taken from the NNW and recorded as part of the World of Worship project. 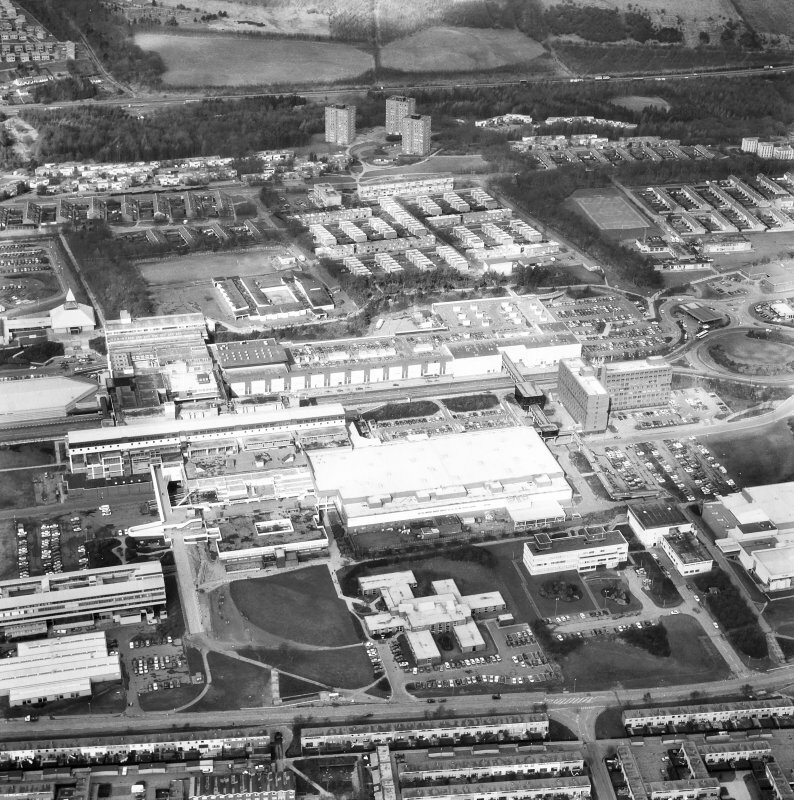 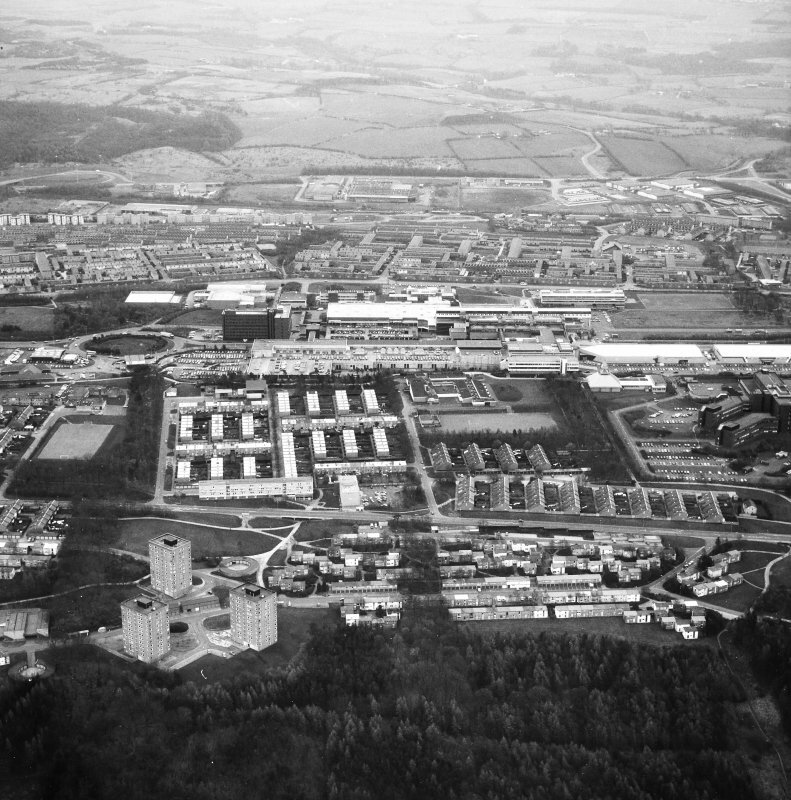 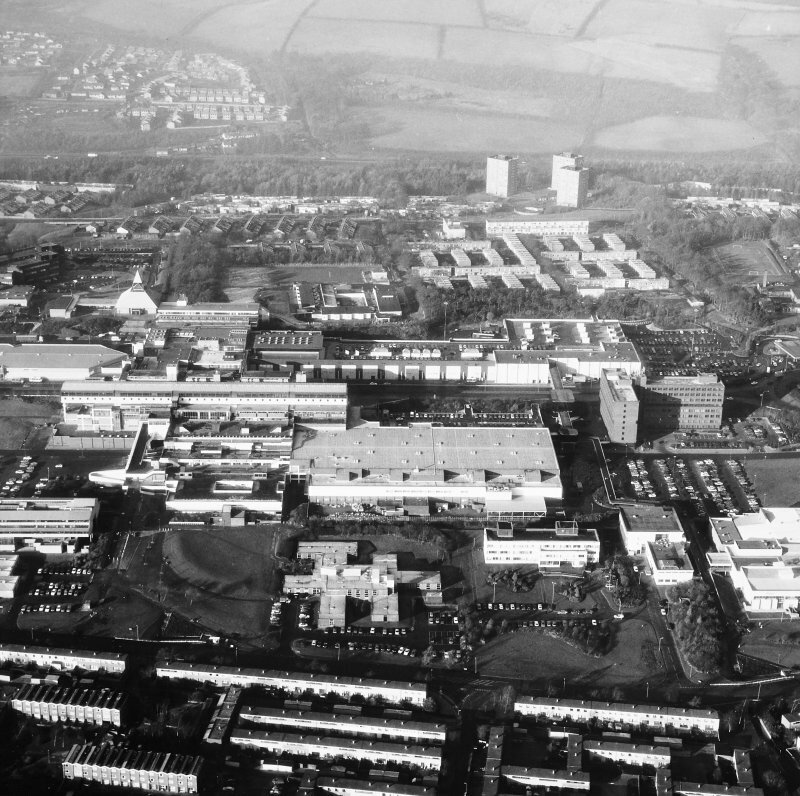 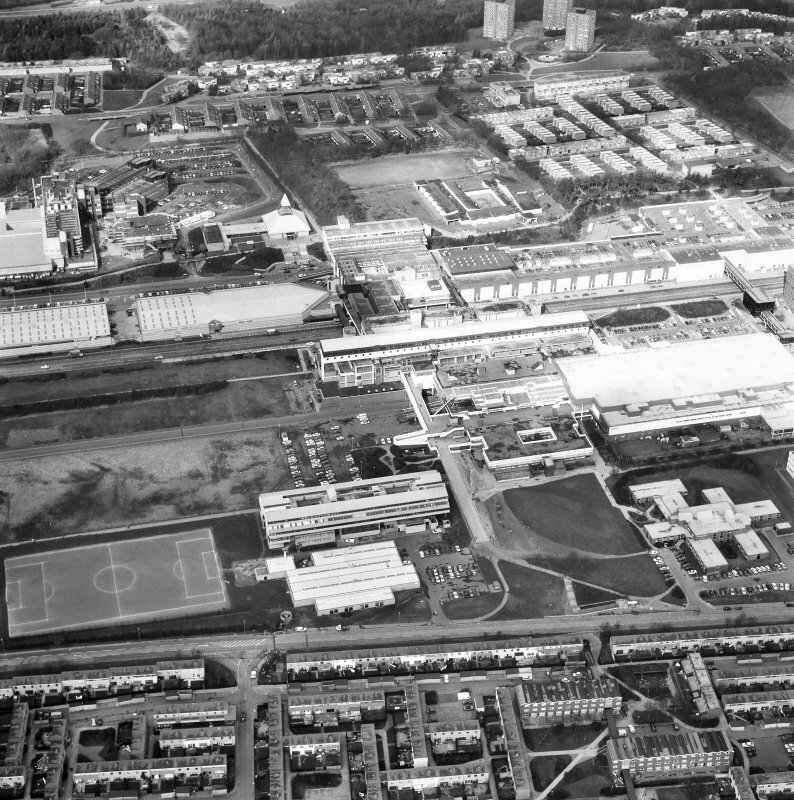 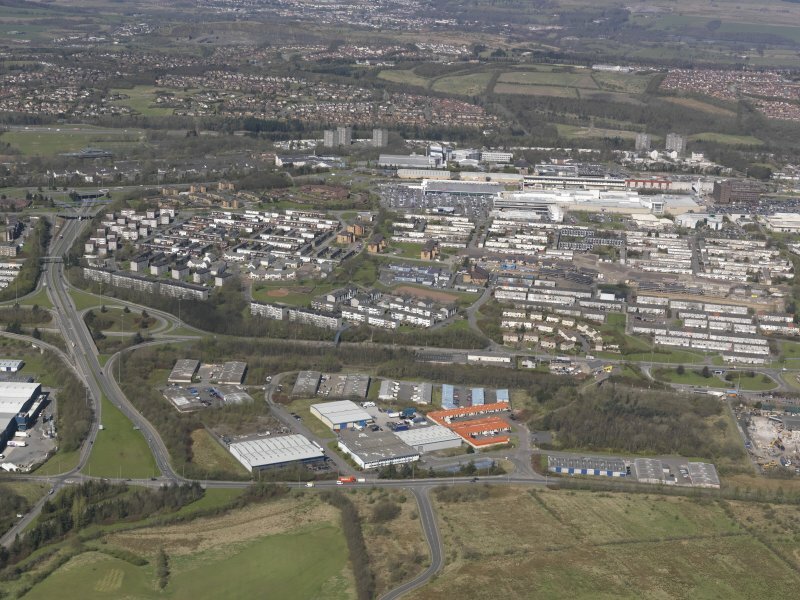 General oblique aerial view of Cumbernauld with Lenziemill in the foreground, looking NNW. 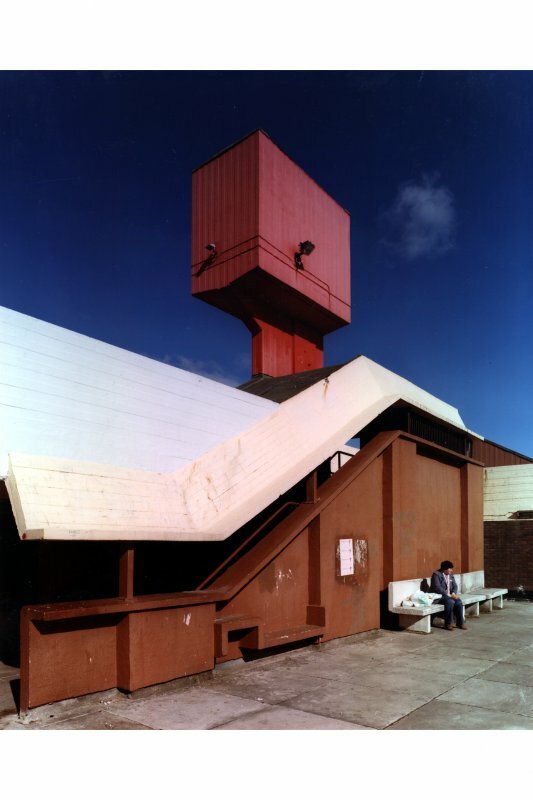 Phase I. 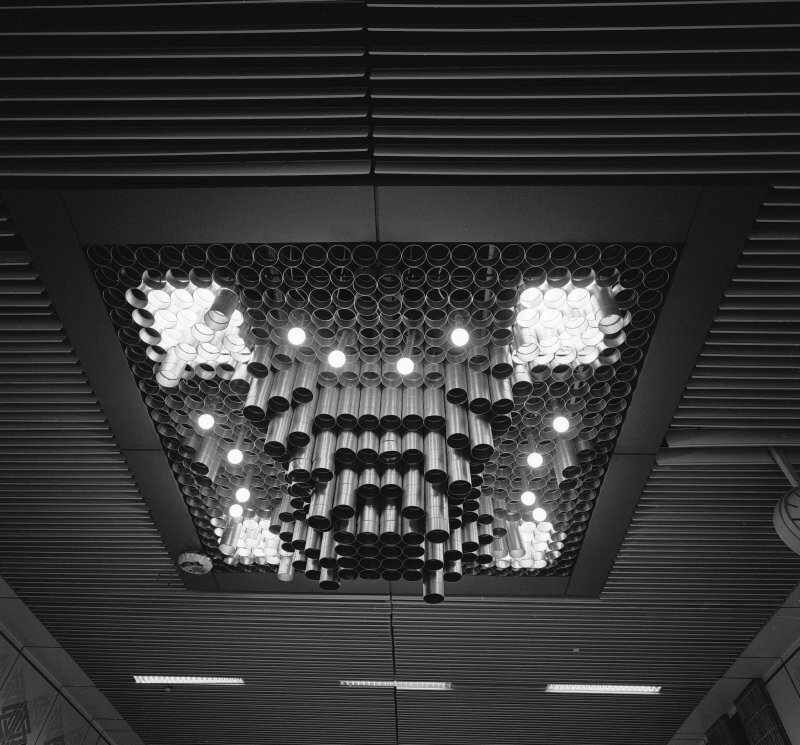 View of ceiling lighting on main concourse. 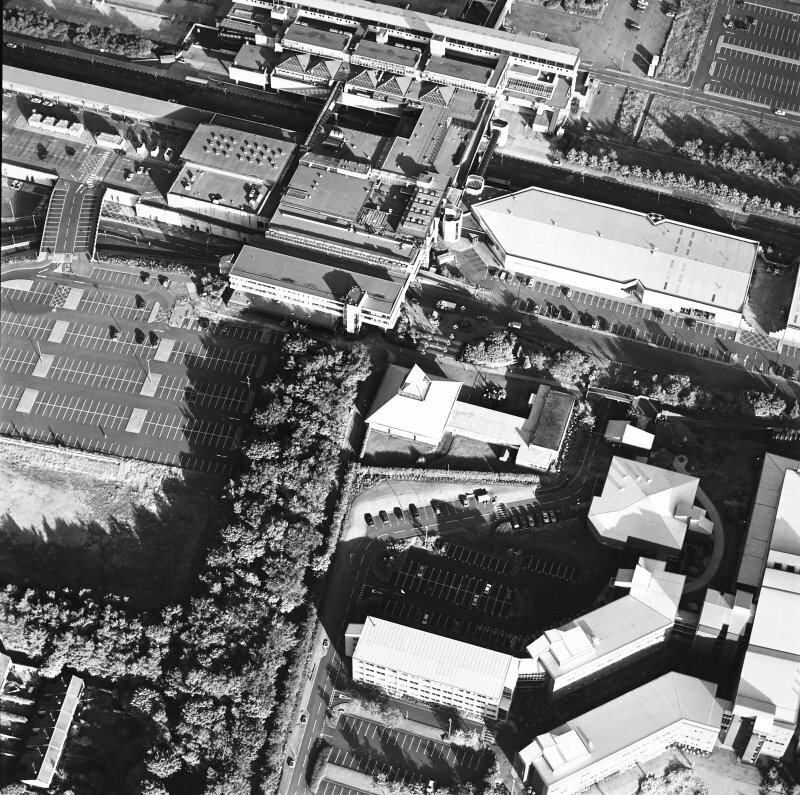 Digital image of B 45112. 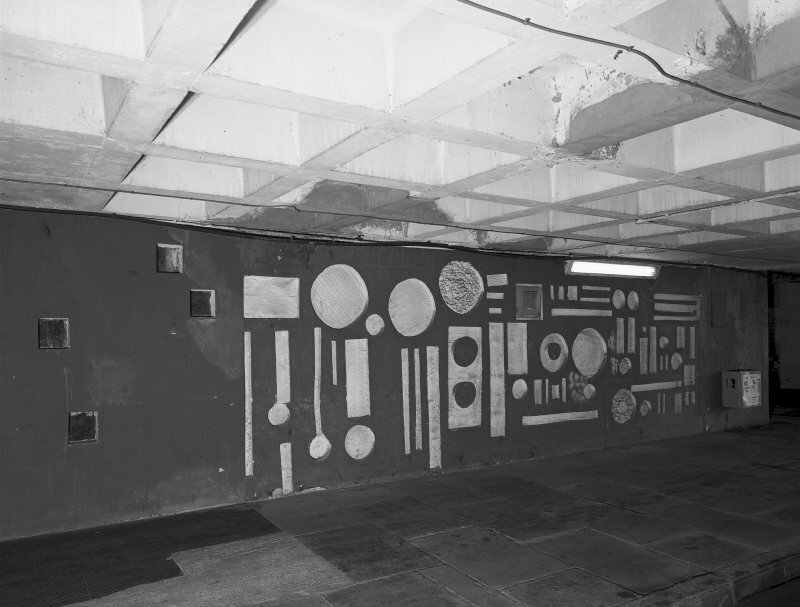 View of relief decoration on South-East wall, first floor, of South Car park, Cumbernauld. 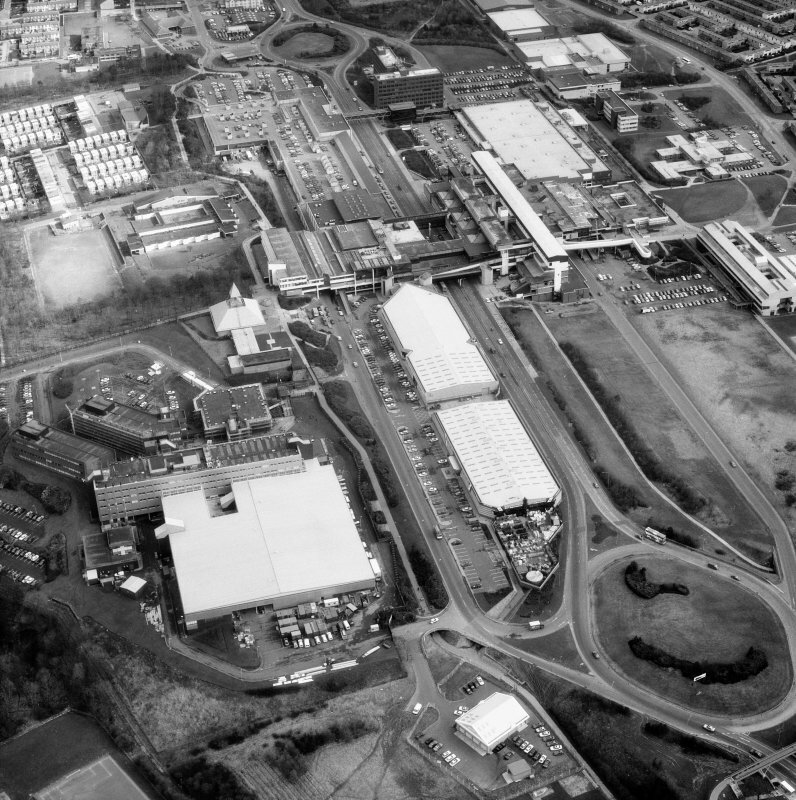 Digital image of B 45100. 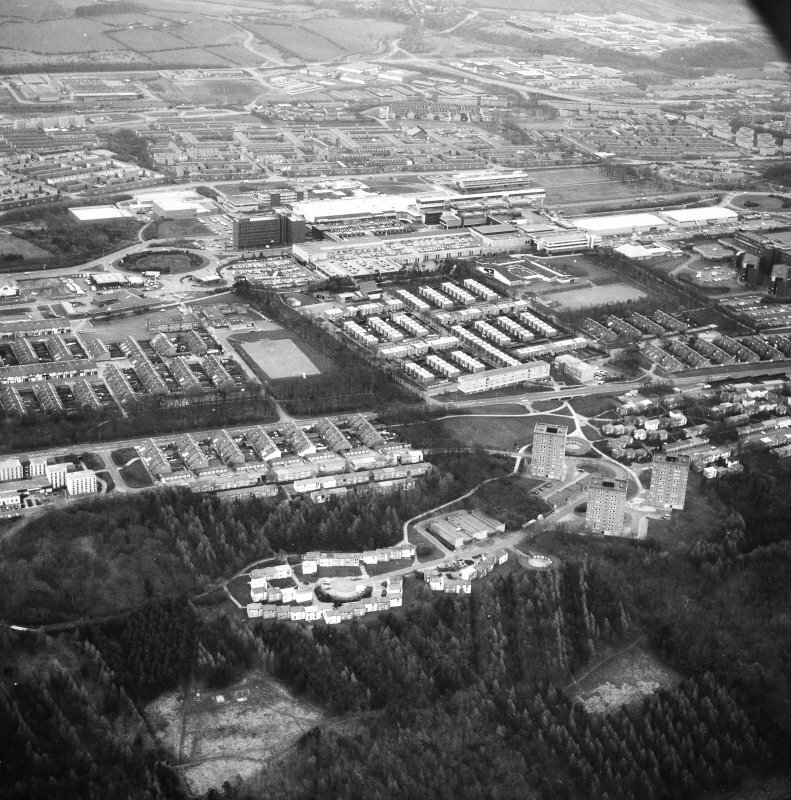 Cumbernauld, town centre, phase one, view from S.
Digital copy of photograph of view of penthouse access corridor in Phase I.
Oblique aerial view. 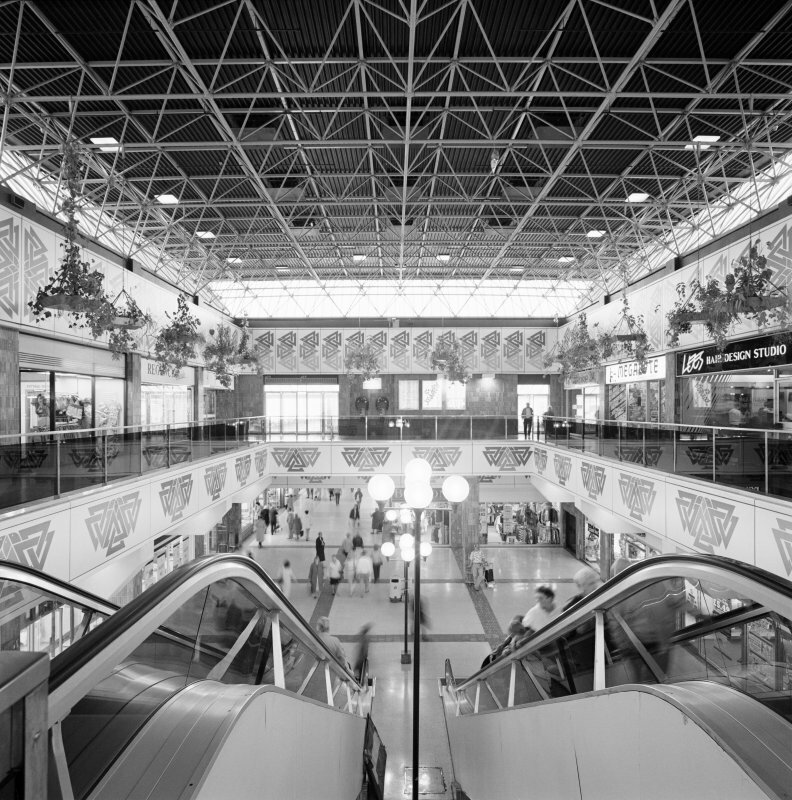 Digital image of B 62831. 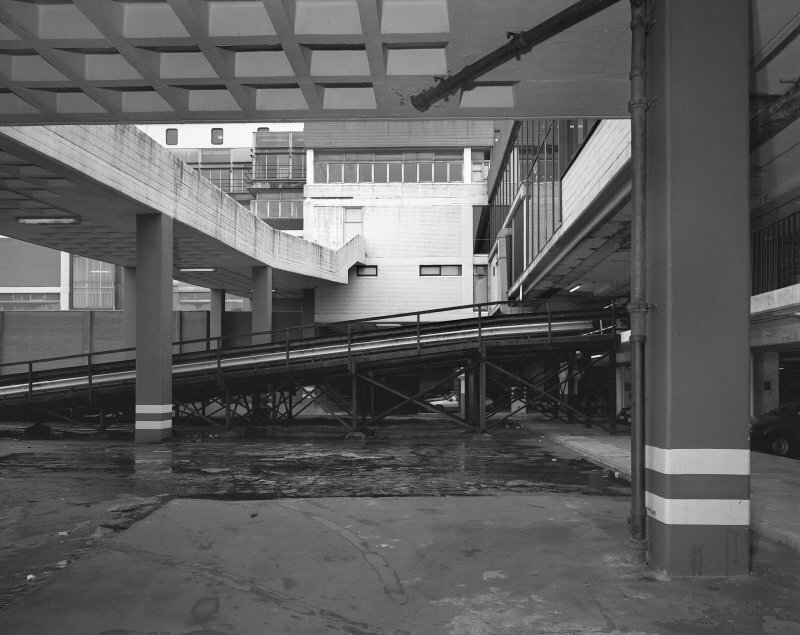 View from North-East of curved staircase to South approach ramp. 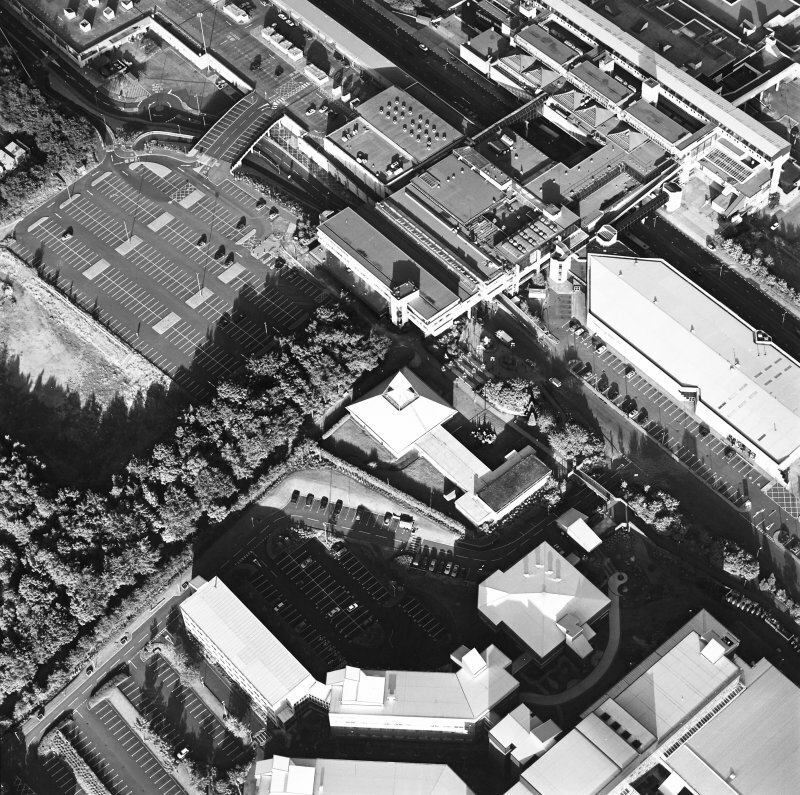 Digital image of B 45089. 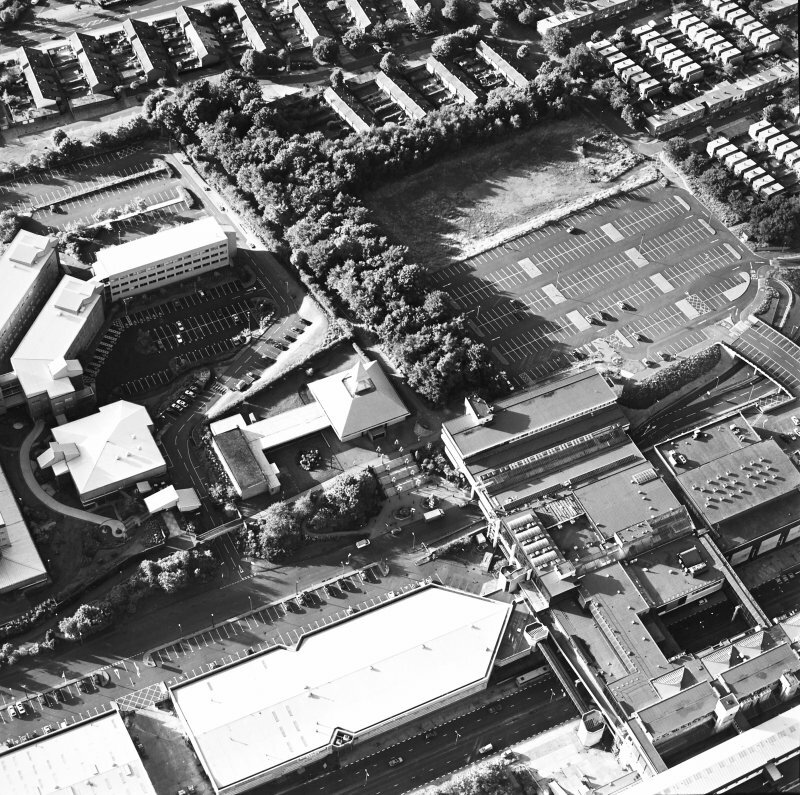 Phase I. 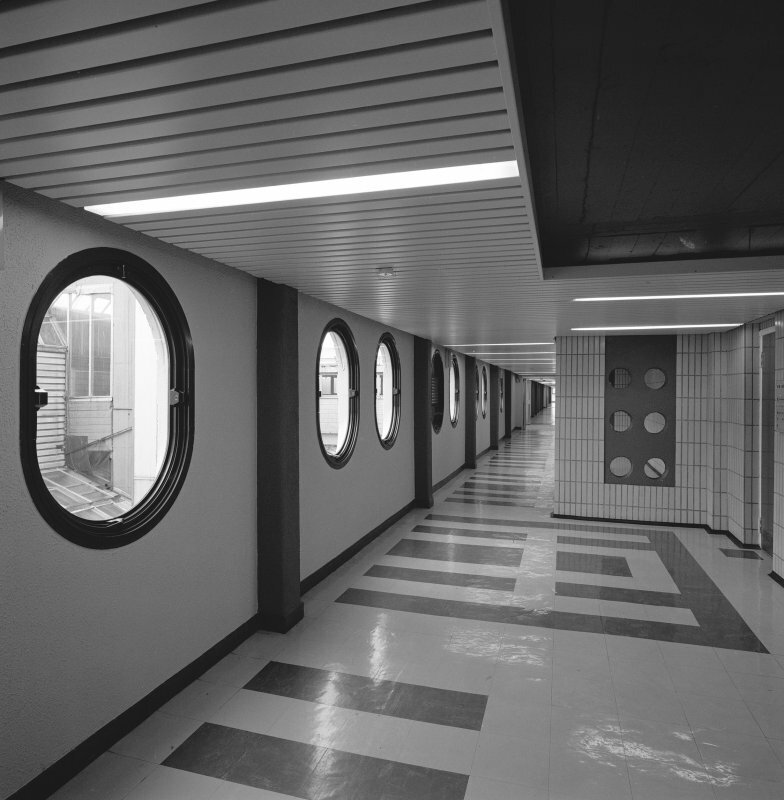 Third floor concourse, view of central library. 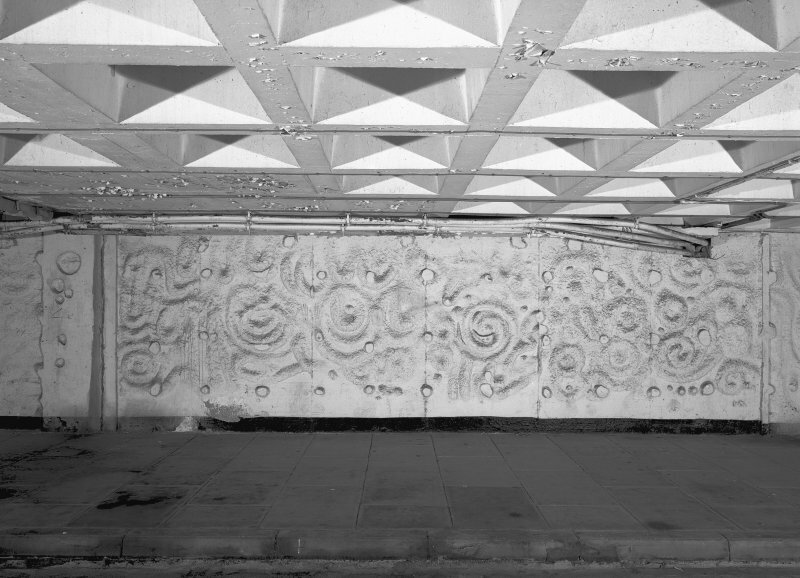 Digital image of B 45108. 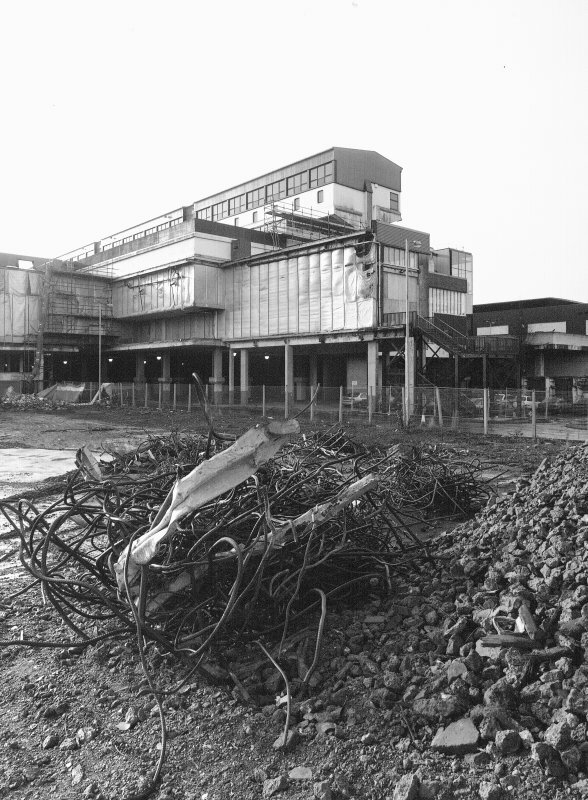 Phase I. 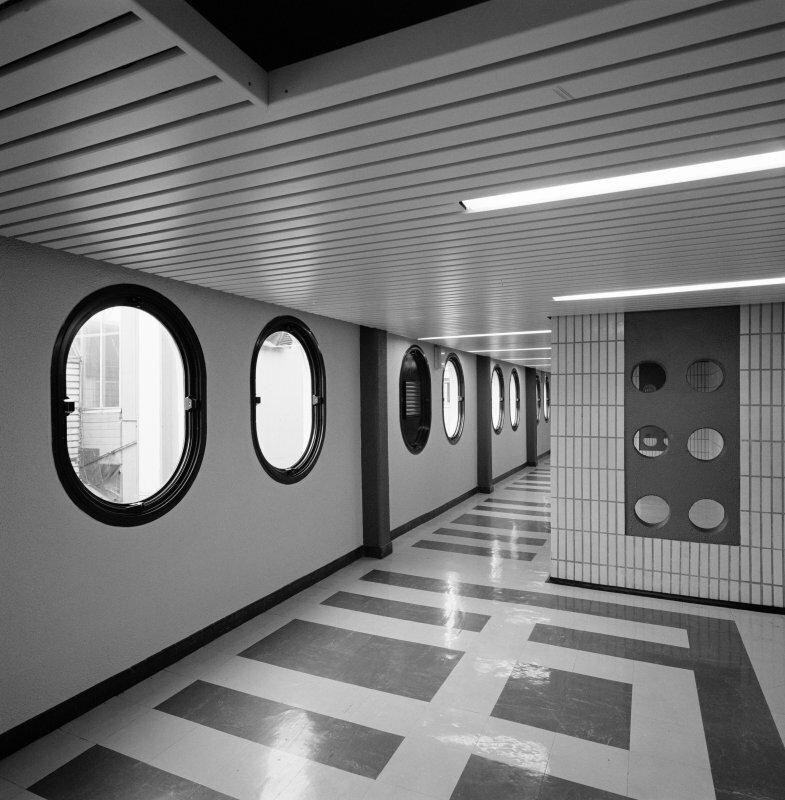 View of penthouse access corridor, Cumbernauld. 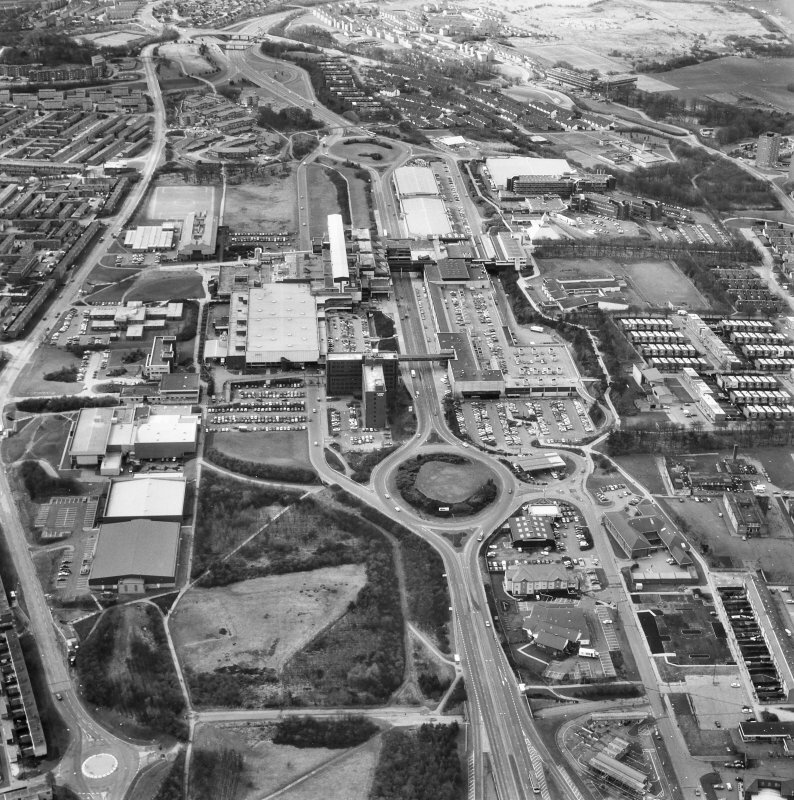 Cumbernauld, town centre, view from SE of north exit from south car park, including bridges and ramps. 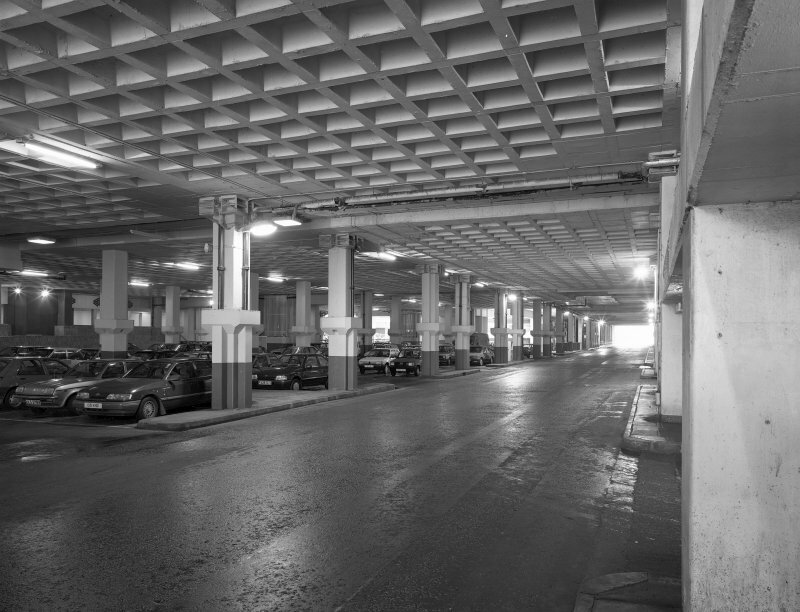 Digital image of B/45095.